There are super humans among us. You know the ones—they climb Mt. Everest, swim the English Channel and run across the Sahara desert. They don’t talk about doing it. They actually do it. But these adventures don’t have to take place in exotic locales. In fact, you don’t even have to leave your own state. One of those super humans is Randy Whorton. He’s the Director of Wild Trails, a nonprofit in Tennessee with a mission "to encourage and promote a healthy and active lifestyle." In light of that mission, for the last three years Randy has paddled across the entire state of Tennessee. 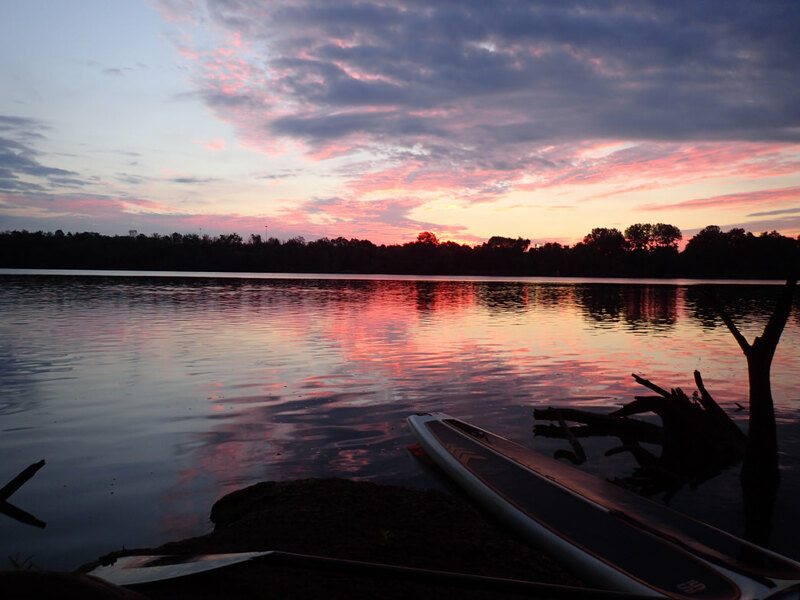 Called "SUP the State", it was originally envisioned as a way to test personal limits, but ultimately sought to raise awareness for the sport of paddleboarding. Randy believes that paddleboarding is “by far the best long distance travel method ever discovered” with its low impact, long-distance capabilities. With the obesity crisis in America showing little improvement, people like Randy spend their days working to find ways to improve the lives of others. The SUP the State route travels from the Kentucky/Tennessee border all the way to the Tennessee/Alabama for nearly 300 miles. Taking place over seven days, the route winds through 20 parks and recreation areas, four state parks/forests, nine wildlife management areas, 10 wildlife refuges, nine towns/cities and passes by 59+ people-free islands. Randy is mostly self-supported with freeze-dried food and gels for the duration of the trip, with the occasional restaurant stop or surprise visit from a friend bearing a bounty of food. In 2014 and 2015, Randy completed his trip across the state in seven days. He upped the ante in 2016, with a goal of using only rivers and finishing in under six days. 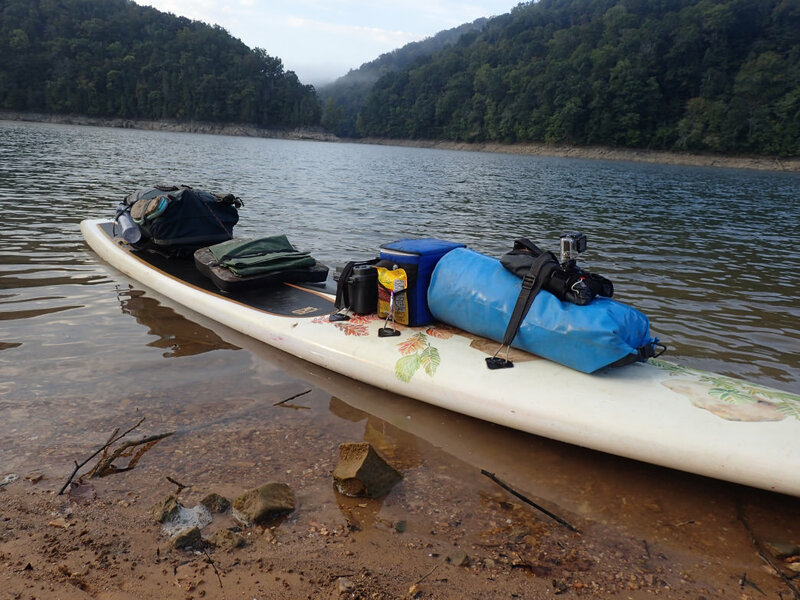 Day 1: Putting in just off of Highway 25E between Harrogate and Tazewell, Tenn. on the Powell River, Randy began his journey carrying nearly 50 lbs of gear, food, and 80 oz. of water. The weather was sunny and clear—a perfect start. The highlight of the trip is a 20-mile section that has zero signs of other humans. Approximate mileage for each day is 40 miles. Day 2: Continuing on the Powell River to Norris Lake, Randy encounters rain making the trip "lively." Day 3: The Clinch River lies just below Norris Dam and provided clear water with lots of opportunities to view the "massive" fish. 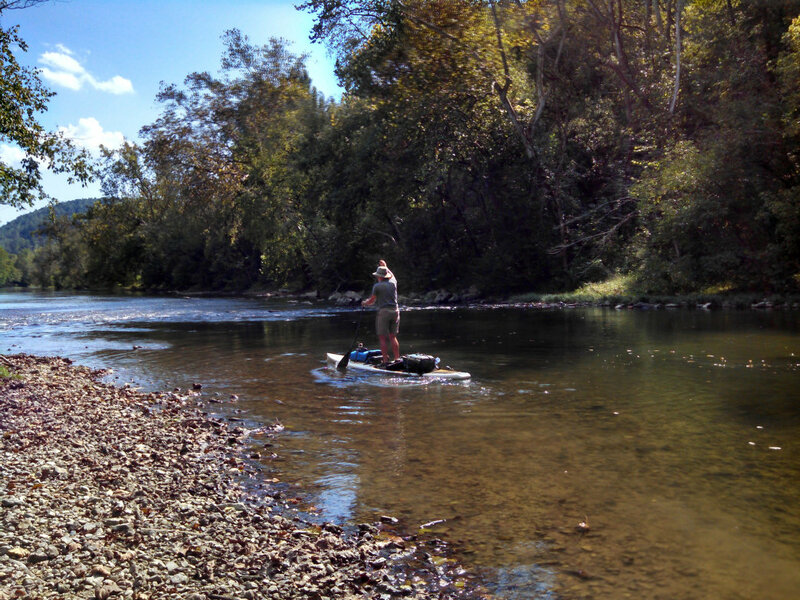 Due to the low water level, Randy had to lift his SUP over the rocks in some sections. For dinner that evening, he treated himself to some delicious eats at Calhoun’s Restaurant on the water. Day 4: Continuing on the Clinch River to Watts Bar Lake, Randy ran into some trouble that forced him to stop for a few hours to repair his board. The delay caused him to paddle into the night in order to stay on schedule. Day 5: Randy traveled through Watts Bar Dam and admitted, "yea, it is a bit nervous staring at the size of these doors. It was such a simple process though, and the guy managing the gate was awesome." The day brought intermittent bouts with the wind but offset the wind with lots of sunny sky. Day 6: Arrived at Chickamauga Lake with sunny skies. He woke up to an amazing orange blaze of a sunrise, and was surprised by a Bass Fishing Tournament taking place. With approximately 100 boats on the lake, Randy was in for a challenging day. Day 7: The final leg of the route started on the Tennessee River towards Mullin’s Cove just on the other side of Chattanooga near the Alabama line. "I saw more wildlife in that one week than I did the rest of the year combined outside of paddling," Randy says. Bald eagles, opossums, snakes, beavers and, of course, fish made up the list of wildlife Randy observed that week. Randy is planning several more SUP the State events including continuing to paddle across the eastern end of Tennessee. He is looking to paddle across North Carolina, Alabama, Colorado (his home state), and is even mulling over a trip down the Yellowstone River. His hopes to have others join him for future trips. "I want this next year to be not just about getting people off the couch, but out doing adventures whatever level you are," he says. While it *for Randy may include paddling across various states (and some endurance trail runs, too), his *it may not be your it. So go walk your local greenway. Go join that kayak group you’ve been pondering over. Try something new. Or maybe consider joining Randy next year and let him take you on an epic adventure. Either way—don’t talk about it. Go do it. We’ll see you out there.